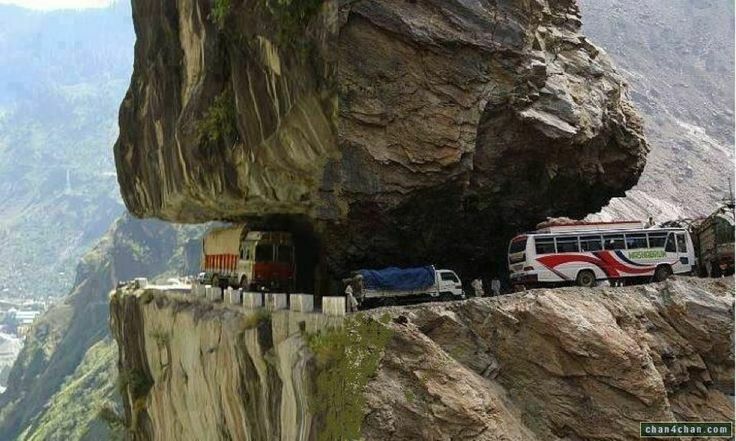 If you’re looking for extreme adventure and are an adrenaline junkie, check out these dangerous roads around the world. The twists and turns, the sharp hills and drops in altitude, or the barren locations are not for the faint-hearted. FeedFond has collected images of these notorious roads, so scroll down and pick your next adventure destination! Aptly named “Train to the Clouds”, this train ride in Argentina is 217-k (134.8 mi) long and passes through clouds owing to the altitude. 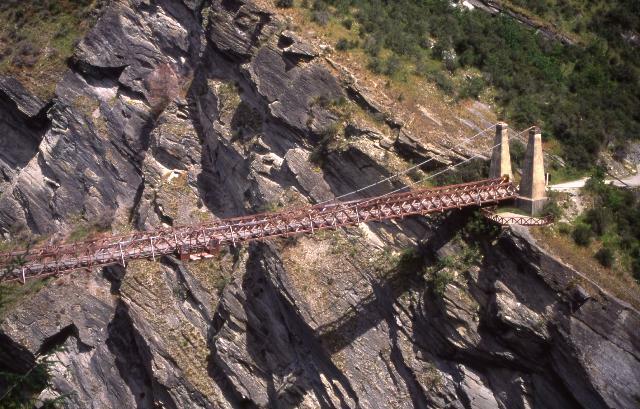 It passes through 21 tunnels, 42 bridges and viaducts, 2 spirals, and 2 zigzags to give you a dizzying experience. Located in New Zealand, Skippers Canyon scores 7 out of 10 on overall road fear factor. This mountain road has a huge, dangerous drop in the ravine that tries the concentration and patience of the most meticulous drivers. What’s more, you need a special permit to drive on Skippers Canyon and the local car hire agencies won’t provide you with insurance. The Tianmen Mountain Road in China is barely under 6.2 miles in length but has a total of 99 turns and 3,937 feet in elevation gain. It leads to the summit of Tianmen Mountain and to Tianmen Cave. Passage du Gois is located in France and connects the island of Noirmoutier with mainland France—it is 4,150 meters long. This passage is accessible only twice a day during low tides. Dubbed as India’s most dangerous railway bridge, Pamban Railway Bridge connects Tamil Nadu’s island of Rameswaram to the mainland. Built in 1914, it was the longest sea bridge until the Bandra-Worli sea link was built in 2009. High winds pose some danger to this bridge and trains are given adequate warning when wind speeds exceed 55 km/h. Eyre Highway in Australia connects Western Australia and South Australia and has a length of 1,675 km (1041 mi). It’s one of the straightest roads without any bends and drivers tend to fall asleep at the wheel, causing accidents. 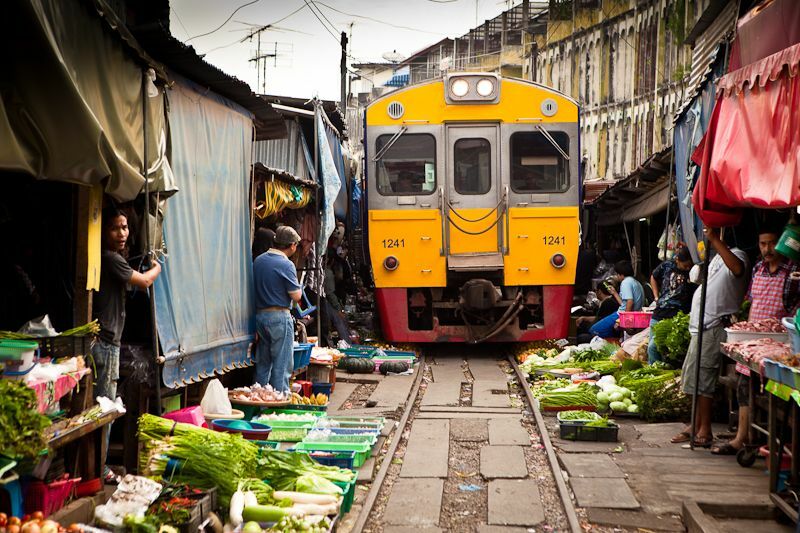 A railway track runs right through this market in Thailand. Maeklong Railway Market is unique in that the vendors pick up their ware and fold their stalls right when the train approaches the track and travels at a speed of 15 km/h. Guoliang Tunnel in China is 0.75 miles long, 16 feet tall, and only 13 feet wide and therefore, drivers have to be very careful and put every ounce of their attention on the road. The villagers from Guoliang built this road and the “windows” in the 1970s, using only hand tools. 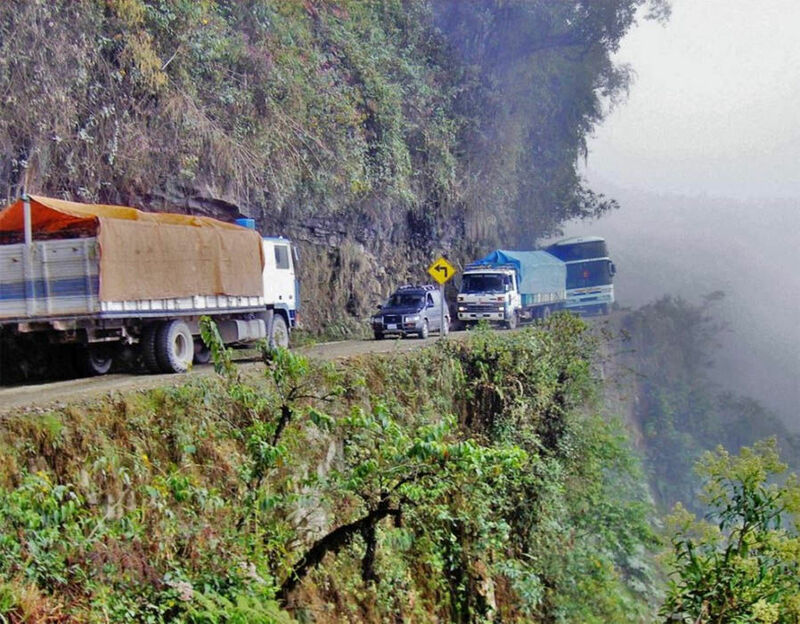 Yungas Road in Bolivia connects La Paz with Coroico. The road is so narrow that at times, a vehicle has to reverse to let another one pass. Made of a number of loops, the road dives from a height of 3,300 to 360 m (2 mi to 1,181 ft) above sea level. Situated in Ecuador, the “Nose of the Devil” railway was built on a rock at an altitude of 800 m (2,624 ft). Until recently, tourists were allowed to ride on the top of the wagons. The Karakoram Highway and China-Pakistan Friendship Highway is a 1300 km national highway in Pakistan which extends from a Punjab province to the Khunjerab Pass in Gilgit-Baltistan. It crosses into China where it becomes the China National Highway 314. It is one of the highest paved roads in the world at a height of 4,714 meters (15,466 ft). Landslides in monsoons make this highway very dangerous. The Leh-Manali Highway in India is a high mountain road that stretches over a length of 479 km (298 mi) among the Himalaya mountain range. It passes through some of the world’s highest mountain passes with a mean altitude in between 2 to 3 miles above sea level. It’s dangerous due to unpredictable weather conditions, high altitude, and no population for miles. 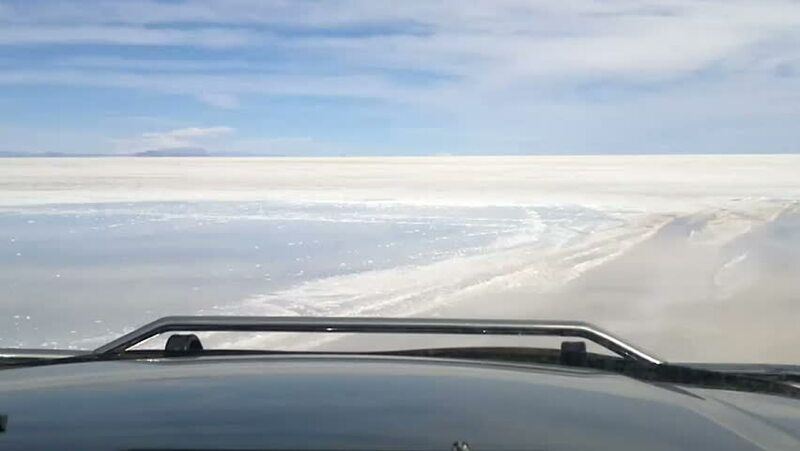 Located in Bolivia, Salar de Uyuni is the world’s largest salt flat located at an altitude of 3,650 m (11,811 ft) and has a total area of over 10,000 square kilometers. The salt depths reach up to 10 meters. Temperatures at night can drop to −30°C (-22°F). With its unusual landscape, it’s easy to lose one’s way here. The James Dalton Highway in Alaska is a gravel highway running for 414 miles. The highway is covered only partially by bitumen. It’s also the loneliest road in the world, with only 3 settlements, 3 refueling stations, and 1 medical center. Whoa! Pick your favorite one and write your views in the Comments section below. For more adventure reads, check out Every Driver Is Terrified To Cross This Bridge in America-Would You dare Every Driver Is Terrified To Cross This Bridge in America-Would You dare?